In 2007, Professors John J. Donahue and John L. Esposito published the 2nd edition of a work entitled, Islam in Transition: Muslim Perspectives. The edition brought together the thoughts of a large number of Muslim intellectuals, religious scholars, revivers, reformers, Islamists, and state representatives past and present about issues concerning Muslim identity, the modern state, and social change. In my own life, I’ve witnessed a significant amount of change, growth, and transition in Muslim understanding and practice over the past few decades. So, it was no surprise to me to observe the variety of perspectives on so many matters of contemporary importance. What ideological diversity reveals ultimately is that many of the best minds often struggle with seeing the forest through the trees. That notwithstanding, one has to appreciate the bravery of those willing to challenge their own understanding and open it up for the scrutiny of peers and superiors. Earlier in life, I encountered talk of the importance of establishing an Islamic state; the obligation of migration to Muslim lands; the impermissibility of living in a non-Muslim country and the obligation of not acknowledging its legitimacy; the unlawfulness of participating in elections and running for office; the unlawfulness of joining the military or working as a law enforcement officer; the unlawfulness of attending an institution of higher learning (not merely because of having to pay interest on student loans); and even the impermissibility of calling the police on a fellow Muslim even if he has committed a crime against me or another. Of course, not all of these opinions can be traced to some work on Islamic law or to an Islamic scholar. But, some of those opinions do have a precedent in the thinking of some Muslims of historical and contemporary influence. I find it important to underscore these views which were popular amongst Muslim populations residing in Western lands at that time―and remain popular amongst many of us ― to shed light on just how much our communities have changed. But, I do it also to highlight how many of us are still clinging to views which reinforce perspectives that are often exploited by hostile parties to corroborate their claims that Islam is not compatible with the modern world or that there is an unavoidable clash between western and Islamic civilizations. There is ample evidence indicating that both things have happened. That many Muslims opine that Muslims are ultimately responsible for westerners having a negative opinion of Islam fuels the anger and suspicion of Muslims who feel that such a view capitulates and accommodates too much of western violence committed against Muslims. It gives the latter very little reason to consider the possibility that certain aggressive policies of Islamic law like corporal punishment, apostasy and blasphemy laws are being understood and promoted outside of their socio-historical contexts. On the other hand, the Islamist group, Al-Gama’ah Al-Islamiyah, who are suspected as having participated in the assassination of Egyptian president, Anwar Sadat, after significant amount of study during and after time in prison appear to be convinced that the assassination was a fatal mistake. They have, therefore, renounced all violent means to establishing an Islamic state. Like Shaykh Hamza Yusuf, I believe that the crisis in the Muslim community today is one of knowledge, not of faith. No one doubts the faith of so many Muslims, but faith can be highly destructive if the doctrines upon which it is predicated are flawed due to either faulty transmission or fallacious reasoning. As Professor William C. Chittick underscores in his Science of the Cosmos, Science of the Soul, the Islamic intellectual tradition has historically placed greater value on knowledge resulting from one’s own exploration and discovery (tahqiq) than on transmission (taqlid). He says, “The goal was to allow people to think properly, not to follow someone else’s thinking” (p. 46). Particularly with respect to the pursuit of answers to questions of ultimate importance, one cannot settle for simply repeating what someone else said in the past. When the latter takes hold of a person’s psyche, he/she confuses religious ideology and dogmatism with the true teachings and aims of the faith. It would be easy to simply discard with any of Mr. Choudary’s perceived pontifications in light of his characterization as a radical Islamist. One, however, is compelled to pause anytime he/she finds a statement attributed to the Prophet Muhammad or the Islamic legal tradition which may unsettle one’s conscience. Did the Prophet truly say, “Whoever insults a Prophet kill him”? In other words, Ustadh Nouman sees the best representation of the prophetic ethos in the reaction of his companions to insults directed towards him during his life. His sentiments suggest that there is no basis for believing that the companions of the Prophet considered the kinds of reactions we observe in some Muslims today. In spite of Mr. Khan’s deeply poignant and timely message, one particular issue he did not address was the question of the aforementioned hadith quoted by Mr. Choudary. Whether or not the report is authentic is somewhat negligible, since as long as many Muslims believe it to be soundly ascribable to him, their faith demands that they comply with the commandments of Allah and His messenger “without fearing the blame of the blamers.” It constitutes for them what is representative of “true” Islam. Hadiths ascribed to the Prophet Muhammad urging others to “kill” people who “curse a prophet” or “change their din (communal convictions)” have troubled the conscience of scholars since the time the pioneer community set out on a campaign to gather and codify the prophetic tradition en masse. The main concern of most of the early Imams was not whether or not the chain of transmission was connected. In instances of inter-scriptural conflict and unless the hadith was unquestionably authentic (mutawatir), authenticity, was typically determined by the relative certainty produced by the report, especially when it contravened another source or principle, of one or another particular scholar, deemed to be more reliable, like the practice of the scholars of Medina, legal analogy, matters of universal need, or a universal goal of the Islamic law. For this reason, we find in contradistinction to many other forbearers, Imam Sufyan al-Thawri ruled against executing the apostate, or at least he ruled in favor of not limiting the amount of time an apostate had to repent and retract his disbelief. The rightly guided caliph, Umar b. al-Khattab, likewise saw no obligation to execute apostates or defectors according to one tradition. A major problem that Muslims face every time there is an international crisis involving their coreligionists is that everyone seems to believe their understanding of Islam to be constitutive of orthodoxy. On one hand, Muslims demand from the media and common westerners to not stereotype or judge them on the basis of what a handful of us do. One the other hand, we often speak as if we represent the entire Umma (community) when in fact we know there are Muslims who do not share our perspectives. Are there Muslims who extrapolate a violent aggressive ideology from the Qur’an and hadith? Sure. They exist. But, no matter how many condemnations or attempts to anathematize those people from Islam, in the end all that we seem to do is reinforce the stereotype that ‘one represents the multitude.’ Are those people not Muslims? That’s not for me to say. Do I agree with their ideology, understanding, and approach? No. I do not. For some Muslims, true Islam is whatever the Sunnis say. For some it’s whatever the Shiites say. For others, it’s whatever the Four Sunni Schools say. Some believe that it’s what originates from a select number of members of the Prophet’s living progeny. For others even, it’s whatever their faction, shaykh or order dictates to them. Faith may begin with an acknowledgement of God’s existence and Muhammad’s prophethood. But, for far too many Muslims, faith extends to their particularized convictions about who is or is not the bearer of the truth, and what educational models and books once studied will guarantee that he/she is truly orthodox. Whatever the orientation or ideological paradigm that one has adopted, what all Muslims agree upon is that Islam is what was brought by Allah and His messenger. The challenge is for us to acknowledge that anything else is nothing more than an interpretation. Did the Prophet Muhammad Kill His Detractors? Coming back to the question of whether or not Muslims are required to believe in the obligation or permissibility of executing people who insult the Prophet Muhammad, reflect on my earlier statement about contemporary Muslim understanding of their faith tradition being in flux. Of course, not every Muslim believes this. And many would cite, in defense of the view that no Muslim has the right to forgive another for disparaging the Prophet in any way, the aforementioned hadith quoted by Mr. Anjem Choudary and the views of the 12th century Andalusian scholar Qadi ‘Ayyad in his famous book, Al-Shifa’. Qadi ‘Ayyad claims a consensus that anyone who disparages or insults the Prophet Muhammad is a nonbeliever. He also claims that the consensus of the Imams of the Four Schools has determined the punishment for insulting the Prophet to be execution. Due to the gravity of the sin, the sinner’s retraction and expression of repentance are also of no avail for curtailing the punishment. But, not to give the impression that ‘Ayyad offers scholarly opinions alone as proof of his claims. He also offers insightful interpretations of a number of Qur’anic verses, and also advances as proof the hadith, “Whoever insults a Prophet, kill him. And whoever insults my companions, strike them.” He also highlights a number of instances when the Prophet is said to have ordered the assassination of the Jewish tribal chief, Ka’b b. al-Ashraf, the apostate, Ibn Khatal, and the two Meccan slave girls who made disparaging songs about him. As a matter of fact Qadi ‘Ayyad reports a considerable number of incidents of the Prophet ordering his companions to kill people for harassment or insult. They were all among his non-Muslim foes or hostile defectors. In light of these references, it seems that Ayatollah Khomeini and his supporters in the Satanic Verses scandal find common ground with Sunni jurists concerning the historical ruling of insulting the Prophet. So, even if the report may be claimed to be spurious or weak is inconsequential, since enough Muslims have made it the basis of a doctrine which purports that if a person insults the Prophet he can be killed. Whatever the social context was that led the Prophet to deem it necessary to kill certain of his detractors, what is clear is that this rule was not absolute. It is also clear that only a governing authority can issue a verdict on such an issue: something that even Mr. Amjed Choudary clearly acknowledges when he says, “The strict punishment if found guilty of this crime under sharia (Islamic law) is capital punishment implementable by an Islamic State.” This is extremely significant and actually challenges the general impression of Choudary as a radical extremist who supposedly justifies the murder of innocent people. It suggests that he strongly believes in due process of law. I would also venture to say that it indicates that he may, perhaps, object to vigilante justice. But, I don’t’ want to speak for him. If this level of conflict exists over what was the Prophet’s normative policy with his detractors, it is understandable why there still remains some level of confusion in the minds of many Muslims. Qadi ‘Ayyad’s claims and reports of unanimous consensus on the matter cannot permanently resolve the ambiguity which remains in the minds of so many. This means that, unfortunately for some Muslim ideologues, Qadi ‘Ayyad’s Shifa’ is not the final word on whether or not a person deserves to be killed for disparaging the Prophet. Furthermore, one must remember that the word, ‘Qadi’, in Qadi ‘Ayyad’s name is a title meaning, ‘judge.’ This means that any opinion he was offering was first and foremost in the capacity of an Islamic judge and in support of what we today call an ‘Islamic state’ arrangement. Does the Public Deserve an Apology? In light of this confusion, the transitional nature of contemporary Muslim scholarship regarding Islamic stateism, corporal punishment, etc., and the degree of ideological diversity, a legitimate question to ask would be, does the public deserve an apology? If not an apology for the actions of rogue Muslims, then what about an apology for causing so much confusion in the minds of non-Muslims and Muslims alike about the true teachings of the Prophet? Stop Trying to speak for “all” Muslims: As stated before, in our efforts to overcome stereotypes, we overlook the very fact that when we issue fatwas that anathematize certain factions of Muslims―either claiming they are not Muslims or that they do not represent “true” Islam, we implicitly claim to be the true upholders of orthodoxy, but a type of orthodoxy which can determine who is or is not a Muslim. In doing so, we reinforce the idea that we represent “Islam” and all “real” Muslims. We would do better to simply highlight that we disagree with the views and tactics of violent Muslims and that they do not represent us. Furthermore, a fatwa against an extremist group does not sufficiently help Muslims overcome the stigma of being an inherently violent religion. That’s because disassociation often carries with it an implied approval of violence being directed against those same extremists. A fatwa by the late Shaykh Muhammad Ramadan al-Bouti authorizing rebellion against the late Muammar Qaddafi provided a good precedent for others to give a fatwa against the current Asad regime justifying rebellion and their ouster in addition to becoming a martyr himself. Violence begets more violence. Muslims cannot tell non-Muslims that Islam teaches the sanctity of life and that the murder of one person is like the murder of the entire human race, but not include Muslims in the category of “humans” who deserve sanctity on some level. Add to that, to tell people that one Muslim’s life can be taken because he/she is no longer considered a Muslim sends the message to non-Muslims that as long as they don’t accept Islam, their lives are fair game for Muslims. If you condemn, make sure it is fair and balanced: In our condemnations of the actions of Muslim criminals, we must underscore that the conditions which produced them were not principally religious. Religion may have been utilized as a justification or a way to overcome psychological guilt that comes with committing acts of great depravity. However, western violence, political and economic suppression, and support for tyrannical regimes in Muslim lands have to be acknowledged publicly as the exclusive catalysts of radicalization and extremism. In offering a balanced critique and condemnation, we have a greater chance of reaching the extremists and would-be radicals whose motives cannot be simply reduced to a desire to enslave the world to their “Islamo-fascist” ideology. Stop blaming the “Wahhabis”: For many Muslims, the problem with violence is Wahhabism. Yes, ISIS/ISIL/IS is without doubt a child of the Saudi regime and the regime’s ideology. But, they also appropriate many of the universal teachings on Islamic governance and in particular the demarcation between friendly and hostile territories regulated by a paternalistic caliphate from an age when the modus operandi was war rather than peace. That, however, does not mean that “Wahhabis” are the only Muslims prone to violence. In fact, Sufi scholars were included after all amongst those who issued fatwas characterizing suicide bombings against Israelis and American soldiers in Iraq as “martyrdom operations” when the Wahhabis were strong and explicit in their condemnation of such acts. Many contemporary Sufis also call to the uncritical adoption of the teachings of Qadi ‘Ayyad’s Shifa’ which prescribes executing people for insulting the Prophet. Engage and Challenge the White World: A major challenge for Muslims is engaging whites throughout the world and challenging their sense of justice. White Muslims and non-Muslims of reason have an added burden, since they understand best the anxieties and biases of whites, especially those who have never encountered a Muslim. Most of the European population and up to 80% of American whites rarely interact with Muslims. This exposes them to severe manipulation by the media, which typically chooses to showcase the worst they can find in Muslims to the white public; that’s not to mention the worldwide resurgence of white supremacist rhetoric now in both Europe and the US, and the rise in influence of neoconservatives whereas republicans control both the House and Senate in the US and their counterparts in Paris are now attempting to exploit this tragedy to the detriment of Muslim safety. 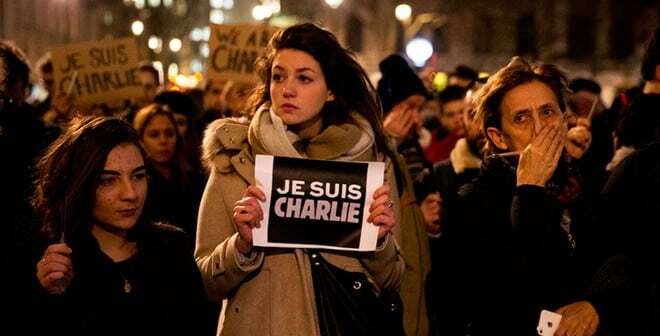 Though a tragedy, Charlie Hebdo was definitely not the most catastrophic world event to happen this past Wednesday. But, the very fact people are led to believe so corroborates the view that white lives matter more than others. Apparently, a number of western powers are attempting to close ranks and ratchet up support for what may be the start of World War III. Take Responsibility for Misleading Others: Furthermore, leaders who have had paradigm shifts over the years must make it a point to explain the wisdom behind the shift in their perspectives, rather than allowing past admirers who may be attached to older paradigms to assume the worst about them. When ideational shifts are not explained to the public, more than anyone else, radicals and extremists are given ample basis for demonizing them and alienating past followers from them. This is because radicals, extremists and the general public are influenced by political culture. In politics, “flip-flopping” isn’t tolerated very much, and it is taken as a sign of one’s lack of clear direction. Religious leaders must emphasize that “change” for the better is at the core of religious teachings. That one changes when he/she sees a better way is laudable, not condemnatory. Repulsion of the negative images of Muslims and ethnic minorities in western countries is beyond the control of Muslims themselves. So no matter how many condemnations or fatwas against extremism are issued, it is the responsibility of the media apparatus to ensure that the imagery does not encourage others to hate and commit violence against Muslims. As a matter of fact, the Prophet Muhammad is quoted as having said, “Those with the most severe punishment with God on the Resurrection Day are the image makers.” Though this is usually taken to mean those who involved in pictorial art, it can also apply―if not more appropriately―to the media apparatus which profits off of the demonization of ethnic and racial minorities. While sitting in my chair waiting to receive dental work this past Wednesday, 1/7/2015, I received an email from a reporter from USA Today by the name, Kelsey Rupp. She was looking for someone to write a counter op-ed to the USA Today’s opinion piece which was to argue that the attacks in Paris was an attack on both free speech and on newspapers everywhere. She was interested in having me argue that the true culprit in this attack was the issue of globalization and that the west needs to learn respect for Muslims and Islam which is a faith which has been around for more than a millennium. I responded that I did have an interest in taking on the task, but I wasn’t certain that I could meet her 5 pm EST deadline to write the rebuttal. Upon this, she responded saying that she had found someone else, and that if there was more time, she would wait. Of course, I expressed understanding, but was interested in seeing the following day who was chosen to write the rebuttal. Interestingly, I arrived home in a timely manner and submitted my post past the 5 pm deadline by only 5 minutes. I knew that it was highly likely that the paper would move on to their other interlocutor, but I at least hoped that my opinion piece could be posted for consideration. On the next day, I really wasn’t that surprised to find that the new interlocutor was none other than what the US Today itself described as a “radical Muslim cleric in London and a lecturer in Sharia” by the name, Anjem Choudary. The choice to me was interesting, especially since Choudary has been adopted as the western media’s poster board child of Muslim radicals living as a citizen in the west. Not that I don’t believe that Choudary has some valid grievances against the west, but this decision made me feel that the media has definitely made a conscious decision to defame Islam and Muslims. For these reasons, I have reproduced below the rebuttal I forwarded to Ms. Rupp for public consumption. Keep in mind that this was written prior to the release of the names and pictures of the alleged perpetrators of this crime. “My condolences go to the family members of those who lost their lives in the most recent tragedy. There can be no justification for the targeted murder of the innocent. The attack on the French newspaper, Charlie Hebdo, has been characterized as not only an attack on free speech, but also an attack on newspapers everywhere. Though emotions run high at the start of such failures at humanity, the same ideas which inform commitment to free speech need to be upheld when thinking of how to respond to such attacks. Free speech must be upheld. But, the same can be said of objectivity and the presumption of innocence of Muslims who had no hand in the attack, because what is almost certain is that there will be more attacks on innocent Muslims, while different media outlets will intensify their disparagement of the Prophet Muhammad. Islam as an excuse for Muslim violence conveniently removes Western culpability in creating the environments in which radicalism and extremism are fostered i.e. via imperialism, economic suppression, and support for tyrannical regimes. When people feel disrespected and powerless, in order to assert their humanity to their perceived oppressors, they at times commit some very unspeakable acts. Abdullah bin Hamid Ali teaches Islamic law (Sharia) at Zaytuna College in Berkeley, California (USA), and is founder of the Lamppost Education Initiative which endeavors to contextualize some of the most confusing historical teachings of Islam to western audiences.